Supporting research and scholarship at the University of New England. Our Office of Research and Scholarship fosters and promotes the scholarly activities of the faculty and students across all of its colleges, programs, and disciplines. High quality research and scholarship generates new knowledge, sparks creativity and entrepreneurship, and creates new approaches to address society’s most vexing challenges. Engaging students in these efforts complements and enriches their education, while advancing the educational mission of the university. On behalf of the Office of Research and Scholarship, welcome! I was honored to take on the leadership of this office in June of 2018. My primary focus is to support scholarly efforts across the university through strategic planning and investment as well as providing research support services. Our team works to help foster collaborations across the University and with external partners, with the ultimate goal of expanding the scope and impact of our research programs. 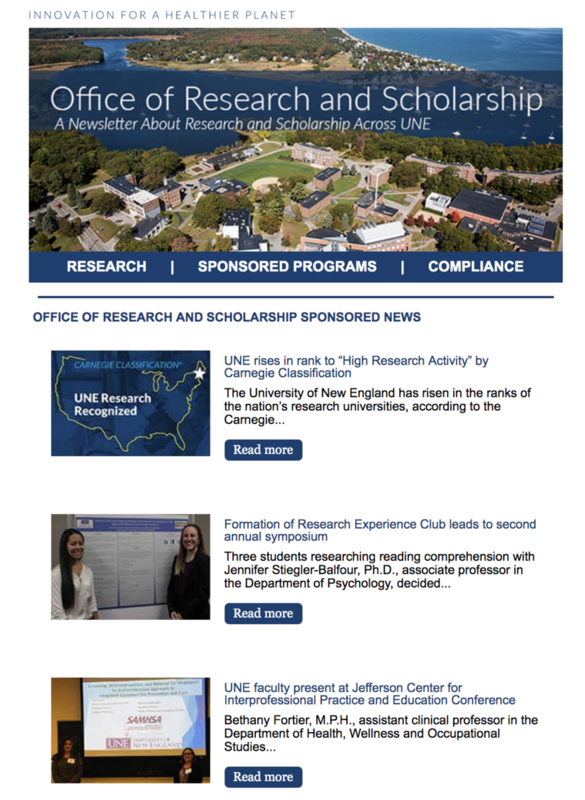 In addition to leading the research strategy for the University, the Office of Sponsored Programs provides administrative support services to ensure the highest level of ethical standards and regulatory compliance in UNE’s research and scholarship activities. 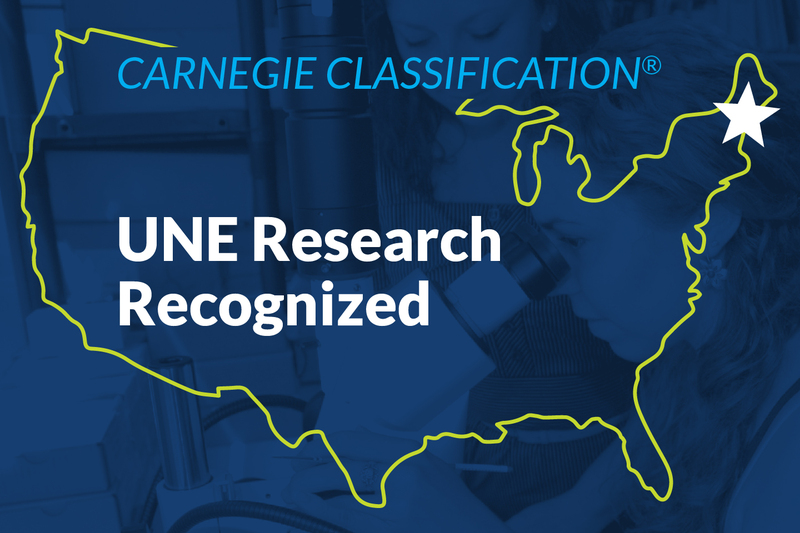 Faculty-led student research is an important part of the UNE student experience. Our team works closely with faculty and students to support student scholarship and experiential learning. This includes student fellowships, travel awards, and myriad opportunities for students to present and publish their work. Whether you are a student, faculty, professional staff, administrator, collaborator or future partner, we welcome you to browse our website to learn more about our programs and support services. We have offices located on both the Biddeford and Portland campuses, so please reach out to learn more about ourresearch and scholarship opportunities! Providing support for faculty and staff to identify and pursue funding opportunities. Ensuring that faculty and staff have all the tools necessary to be competitive. Encouraging student participation in research. Ensuring compliance in all research functions. Number of undergraduate students who have given presentations at regional and national conferences during the last six years. Percentage of UNE seniors who have worked with faculty on research projects, compared with 23% at all colleges surveyed by the NSSE. Number of UNE faculty and staff peer-reviewed publications in 2013 cited by the Scopus database. Represents a 274% increase over 2003. Find out more about undergraduate student research and scholarship opportunities. "The ability to make change is what drives me."